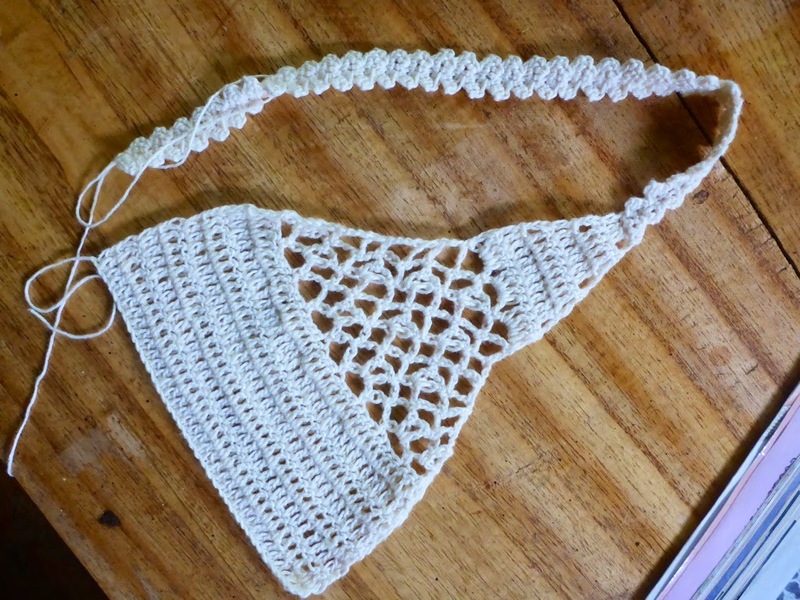 “Touché Temptair” is a pair of crocheted underwear that sits at the hips and ties with a string. 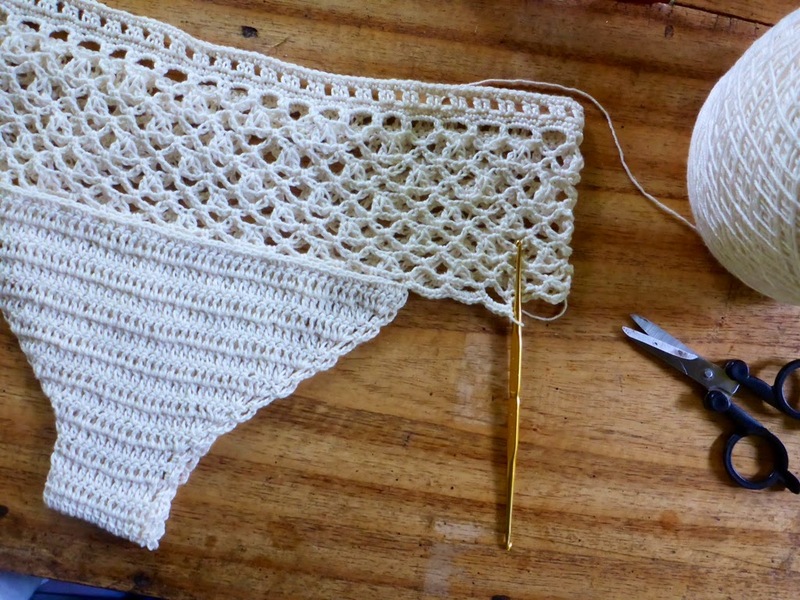 It starts at the waist, in the round, then continues at the center-front for the crotch, decreasing to make the crotch panel, and then increasing towards the back. 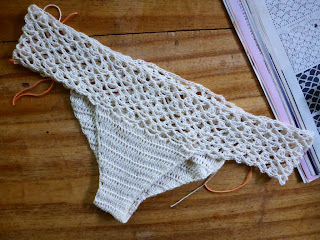 A lace is then crocheted all around the last round of the underwear before the crotch begins. 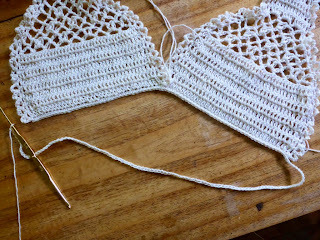 A waistband is then crocheted with a heading through which ties are woven. 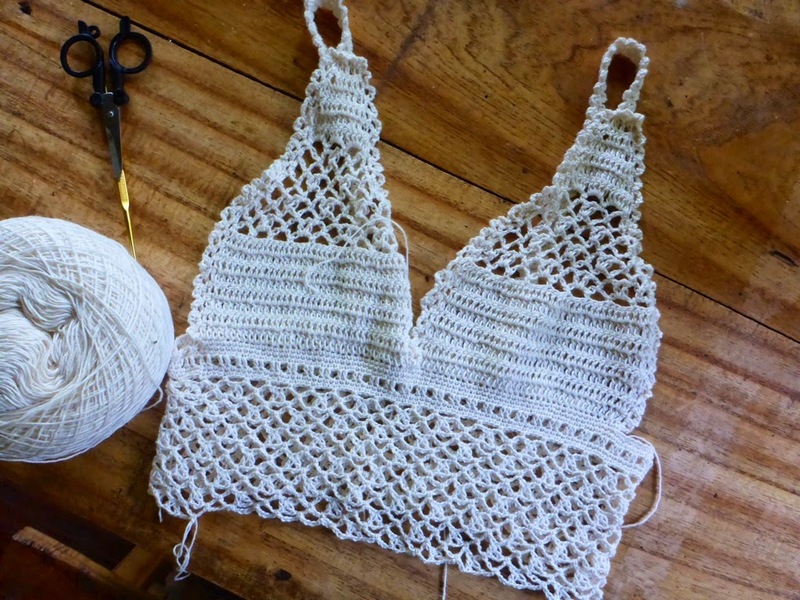 A matching mini camisole is crocheted beginning with the cups, separately, with the ties. 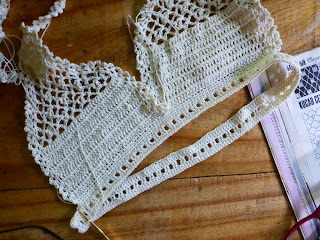 Then the lower section of the camisole is worked in the round, joining the cups. 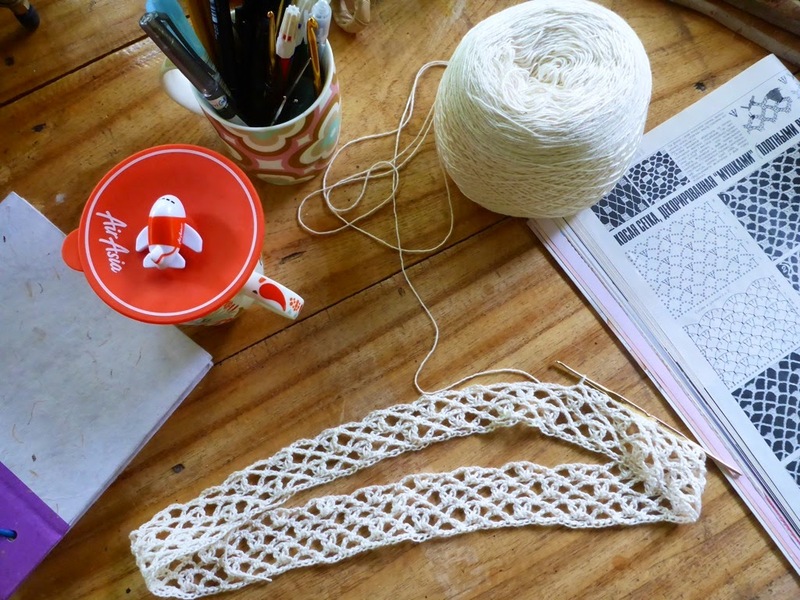 The basic openwork pattern for “Touché Temptair” is based on a pattern found in Duplet Issue No. 112. Duplet is a crochet fashion magazine published in the Ukraine. It is an amazing source of inspiration for crocheters. The challenge here is to modify the openwork pattern, which is worked in rows, so that it can be worked in the round, for the underwear. 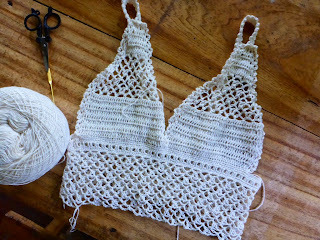 The next challenge is to modify the openwork pattern to make increases, for the matching mini camisole. 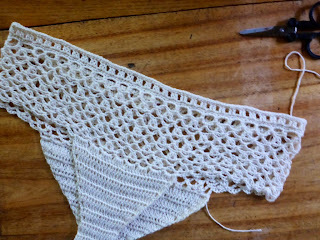 I used 4-ply cotton yarn and 2.25mm hook. 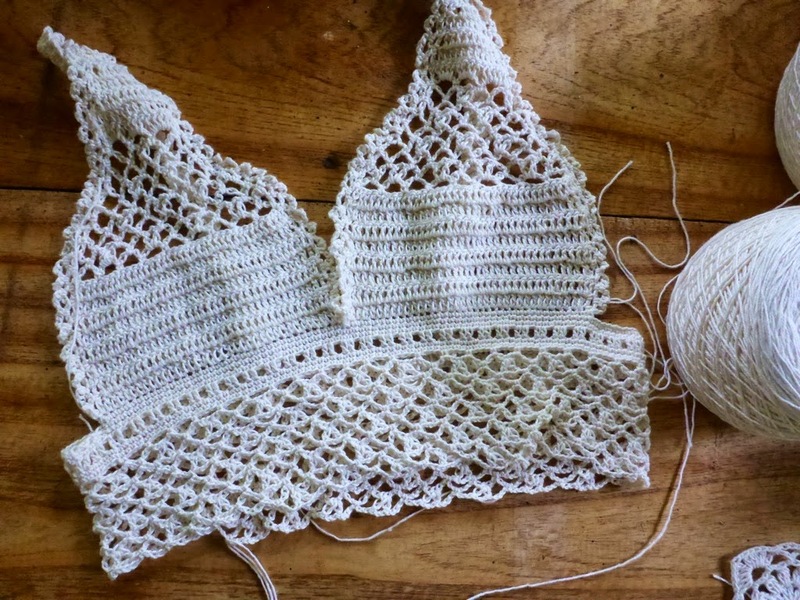 Using openwork pattern below, make a bralette and underwear set. 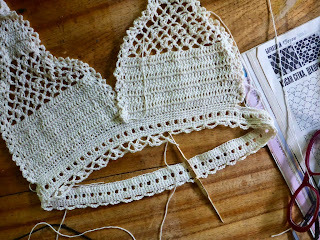 To make the mini camisole, I started with the cups. Each cup is exactly the same, started at the base. Measure the base at about 16cm, then make several rows of dc to measure at least 7cm. From there, the openwork pattern is begun. 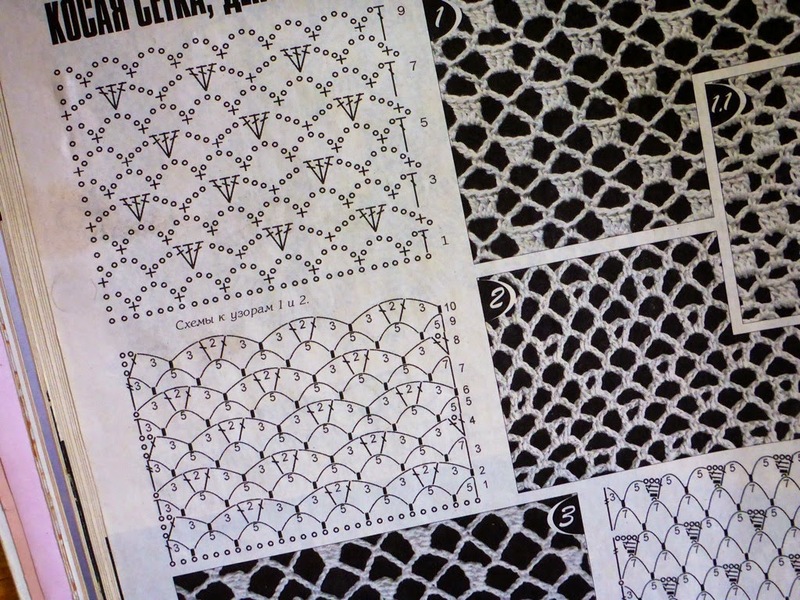 The openwork pattern here is worked in rows and must decrease to shape the cup, a triangular shape. 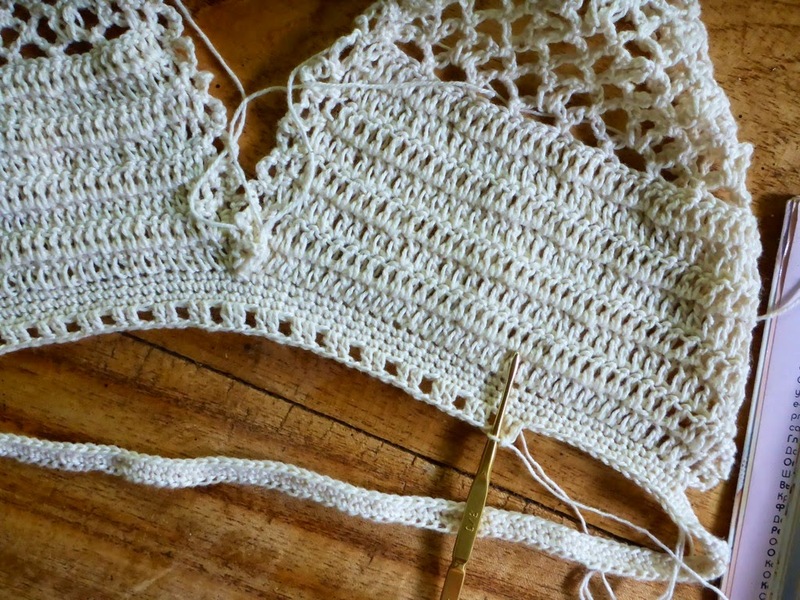 Do the decrease at the 5-ch loop rows. When you have 3-ch loops left, you can make a few more rows of solid dc, decreasing, and there the straps are sewn on. 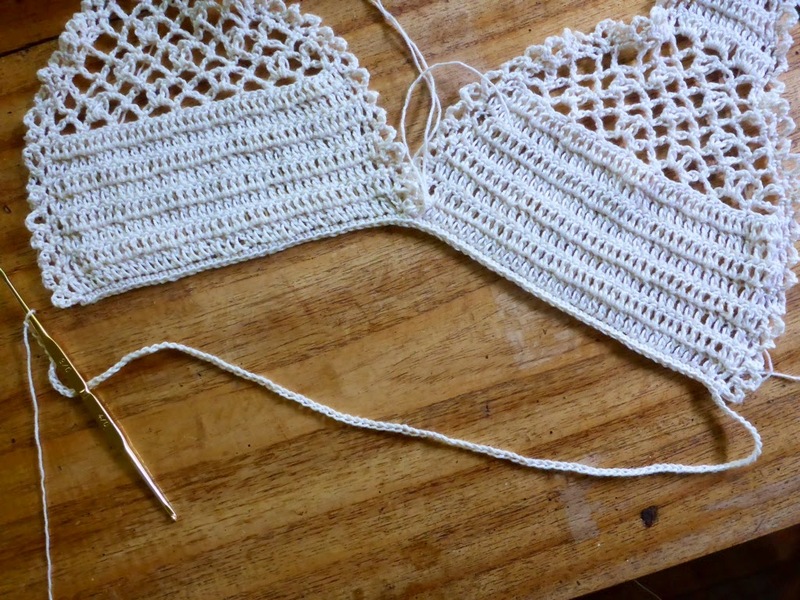 The bra trim is very simple – an even row of 3-ch loops followed by a row of 5-ch loops. The cups are then joined at the base when you work the band. A couple rounds of sc, and a mesh of 2-dc, ch 1, sc, is made and from there, the openwork pattern is used again – this time worked in rounds. 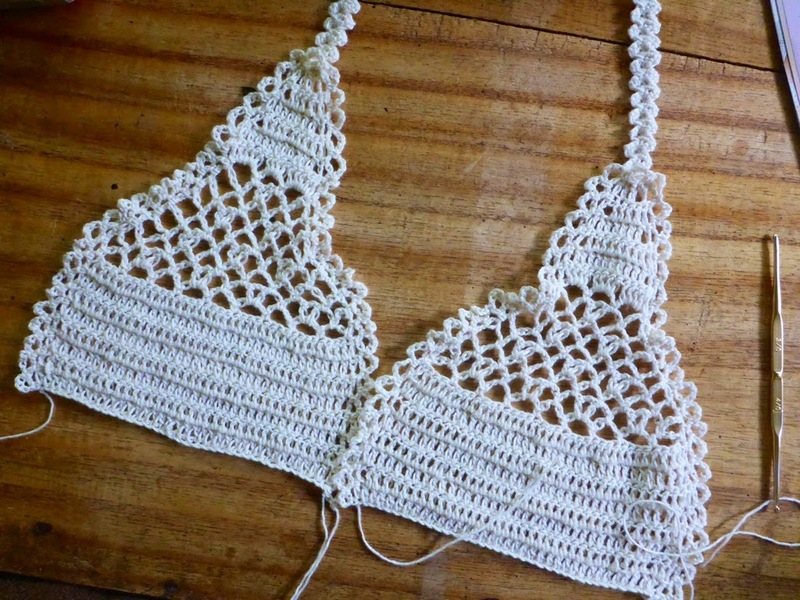 The same 5-ch loop/3-ch loop trim of the bra cups is made at the hem of the mini camisole. Begin at the waist with a chain that goes around with hips with an allowance of an inch or two. Work the openwork pattern in the round a couple of rounds, then make the front and back in solid dc stitches. More info about crocheting underwear may be found at Walkednights. 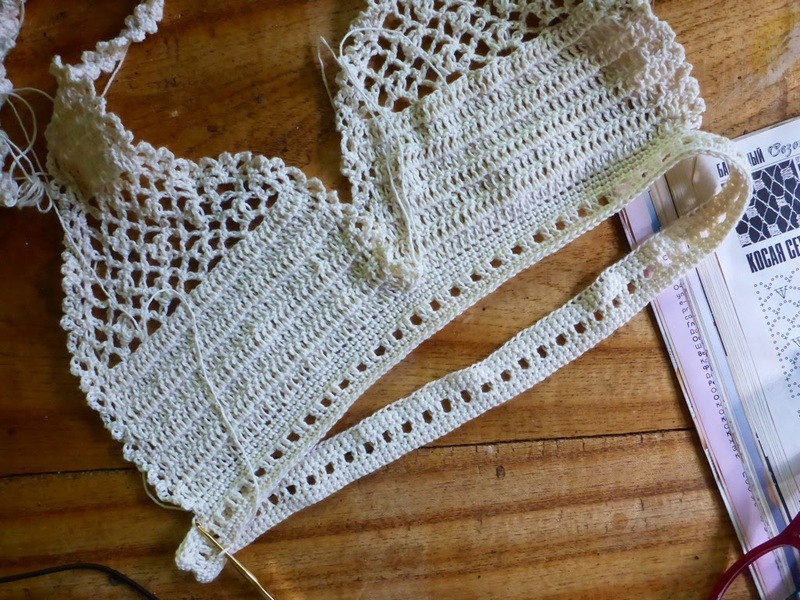 Make a strong waistband of rounds of sc, 2dc-ch1 mesh, sc, through which the ties are woven, then work all around the leg openings a round of trim used for the bra – ch 3 loops and ch 5 loops. that's so pretty and feminine.